Mobile theatre video glasses are the portable virtual gadget that is perfect to watch 52 inch cinema display at anytime. Imagine being able to privately watch movies on a 52 inch cinema display at any time, While on the bus, in the park, or even at the library... Well, this dream has now become a reality thanks to this Mobile Theatre Video Glasses! 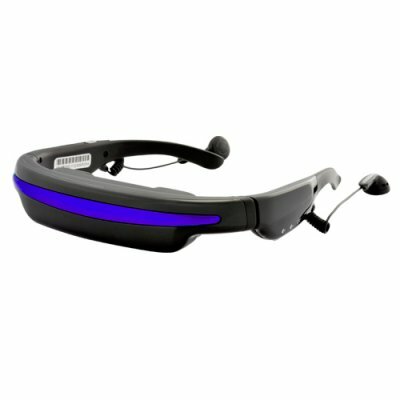 Portable DVD players and MP4 players are out, meet the newest and most high-tech way to watch movies on the go - the Mobile Theatre Video Glasses! Providing an advanced 52 inch virtual screen that will make you feel as if you are actually sitting in a real movie theater, this gadget is the ONLY way to enjoy your favorite media files on the go and in an amazing large display cinema-like quality. If you are looking for the ultimate portable media player then you have definitely found the right product. This Mobile Theatre Video Glasses is a must have for any gadget lover and is brought to you at a factory-direct price that can't be matched. It also comes with a 12 month product warranty. From the leader in wholesale Android tablets and smartphones, Chinavasion.